Doh, sorry I typed this an hour or two ago and thought I had posted it, came back to office and noticed it was still sitting ready to click post…. Well after a tricky day yesterday which nearly ended quite red, I am going to play extra safe today by using half stakes and looking for only the best opportunities. I may actually do this until 3rd Jan when all this festive stuff should be well out of the footballer’s systems. 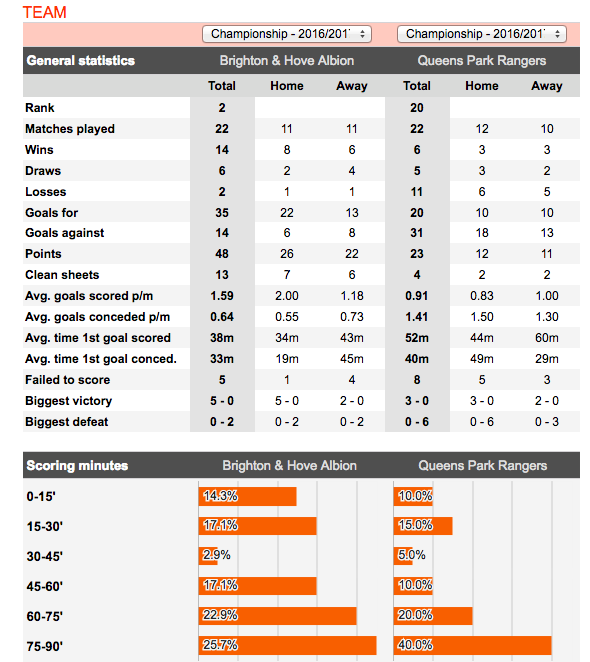 Bright v QPR – A good example of caution here as this is a very nice pick normally. I am looking for extra ways a trade can go wrong now, and although this is strong and Brighton should be 1-0 or 2-0 up by HT, I am going to assume it starts like Man City game did yesterday and hope for a 0-0 at HT which would be a great entry with half the risk. Of course I may well miss trades doing this, but I would rather miss some green then kick myself over reds which I felt I could have avoided. So HT LTD if level. That may change, for example if it’s 1-1 by 20 mins played, then I would be in, but not until I am sure the game is going to play in line with stats. Aberdeen – Again looks strong, although not as strong as the odds suggest which makes it a no trade due to lacking value at least from KO. If it’s 0-0 at HT, i MAY have a go, but probably not as the BSP (betfair starting price) is so high it will skew the whole journey of odds down the chart if no goals, i.e. its starting from too high so will probably still be too high at HT especially after the LTD junkies dive in thinking they can’t lose (IF 0-0). In fact these days I sometimes have a 5 minute LTD just as they kick off the second half, if level, as the amount of people laying the draw CAN sometimes provide a virtually free trade, in fact if it’s very busy the odds can even drift sometimes during that period! Most likely here is a no trade, but if its 0-0 after HT i may keep an eye on the U2.5 odds and get in around 1.2 and 1.1 in hope of a goal before 80 mins to get some green. Derby v Birmingham – No trade as I don’t trade derby games. HAHAHA, sorry, put that down to the silly season! This has 0-0 or 1-1 written all over it. I used to do a lot of this but don’t much these days, not sure why really, but just in case anyone fancies this kind of trade – Could back the draw for 15 minutes hoping its a slow start, bank some green by getting out, but leave that green on the draw (dont green, just exit with same stake you backed with). Then choose a period to use that green for a free bet, or just bank it. For example you could LTD after HT for 15 mins, or last 15 of the game if level. Or of course you could do as I have done in the past, and leave the back the draw in place until HT, obvious risks so staking needs to cater for a loss via a 2-0 lead by home team, but I think the stats suggest a close game here with most likely scorelines being 0-0, 1-1 or 2-1. Just mentioning this to give people idea for things to play with, certainly not advice and I wont be doing this myself as I just tend to find enough in play ops to trade these days that I don’t bother with this stuff, but I certainly did ok with it when I did. Obviously its a long term approach so expect losers and be prepared to absorb them. Something for stats and footie data junkies to play with perhaps..
Genk v Gent – YUK, It’s Belgium!! Tightish game likely on stats, and with the Xmas effect, who knows maybe it will minus 1 goal each. HAHA, more xmas silliness. IF this game got to 75 mins without goals, I may consider a LTD or Lay U0.5 as a bet if liability was low enough. Just had a lay 2-2 of the Bangladeshi Brothers Union Game! Wouldn’t normally trade such a league but I’m quite sure their players aren’t as stuffed with Xmas turkey or running around like headless idiots like some of the turkeys playing yesterday in the English & Belgian Leagues!! i hope you had a good xmas…. i am glad yesterday my wife said she will kick me out if i turn the computer on it seems like it was a bit stressful. so you are saying i missed greening the mrs? ((Just in case she reads this))!! Well just as long as the Bangladeshis bring in the green, (or the bacon!) & don’t start telling porkies then I’m happy! Very nice indeed. When you say 15 min LAY on 0-0, do you mean back? phew I thought you were onto secret method there! !